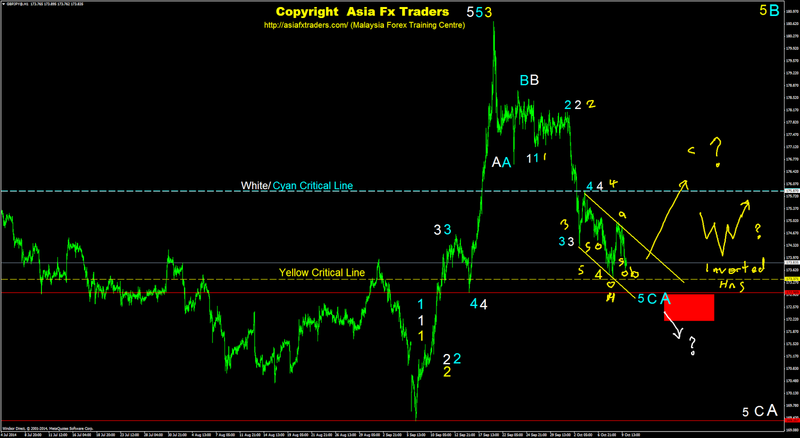 At the moment, I am expecting market to perform a bearish reversal trend scenario either in white or yellow. A pullback or bull trap pattern would bolster to this scenario. Otherwise, please be careful for another strong bullish rally to complete corrective wave B in aqua. Happy weekend and good luck. At the moment, I am looking forward for an opportunity of a bearish reversal trend scenario either refering to the alt counts in white or yellow. A strong breakout toward the lower white trendline and critical line would bolster to the alt count in white. 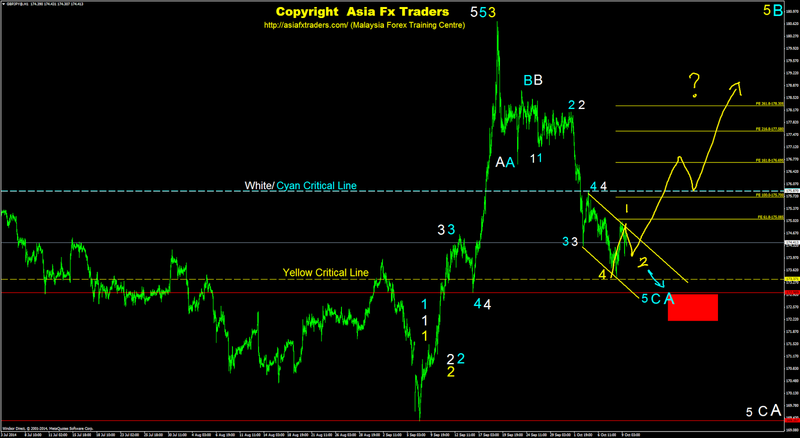 Otherwise, I am expecting a "bull trap" pattern in yellow before a potential of reversal trend. Good luck. At the moment, a breakout toward the lower red trendline would bolster to the alt count in white. 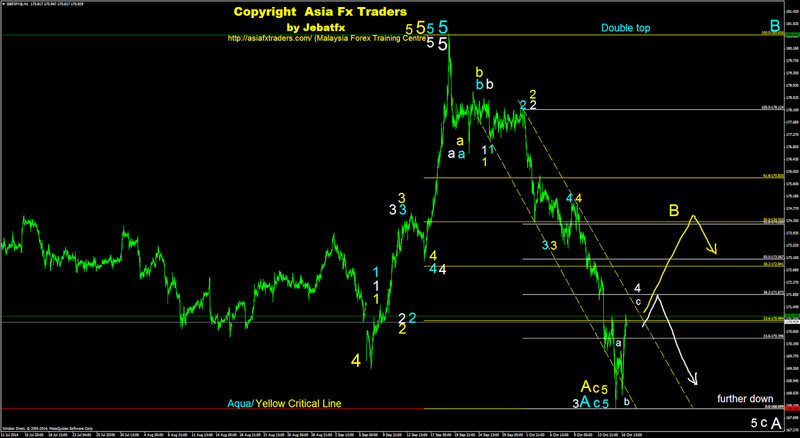 Otherwise, I believed we may see another bullish continuation trend scenario to complete corrective wave B in yellow. Good luck. Preferably, I am looking toward an opportunity of another bearish continuation trend scenario either refering to the alt counts in white or yellow. 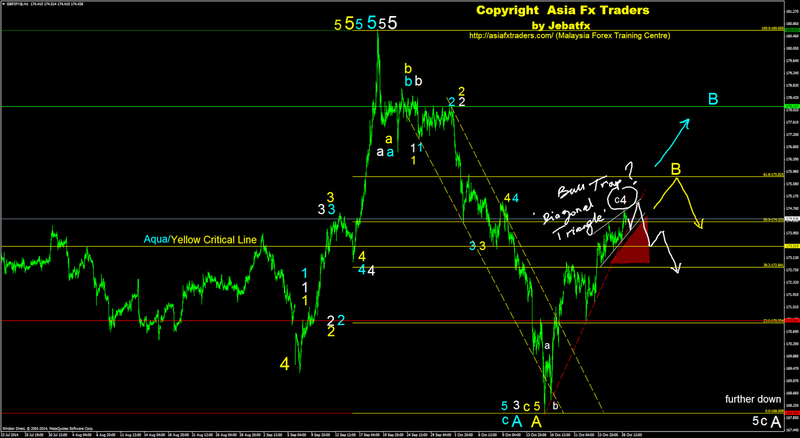 Otherwise, we may see another bullish rally to complete corrective wave B in aqua. Good luck. Selamat Menyambut Maal Hijrah 1436. May God bless us all. 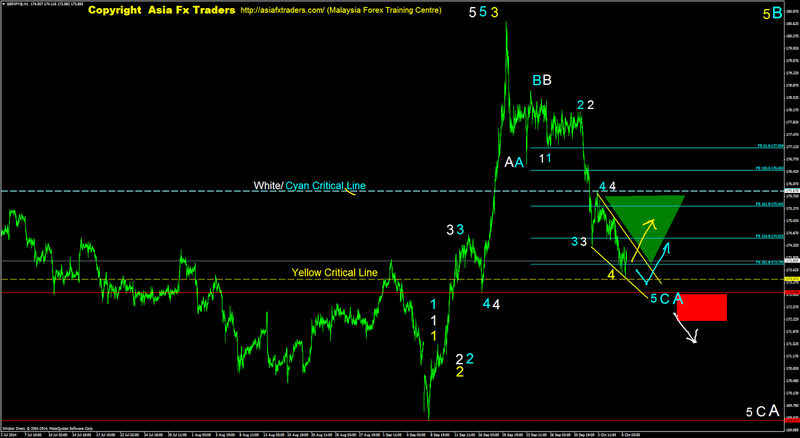 At the moment, I believed market will further going up either to complete wave 4 in white or corrective wave B in yellow. Otherwise, market may break the lower red trendline and perform another bearish continuation trend scenario to complete wave 5 in aqua. Good luck. A breakout toward the upper green trendline would bolster either refering to the "Bull Trap" scenario in white or another bullish continuation trend scenario in yellow. 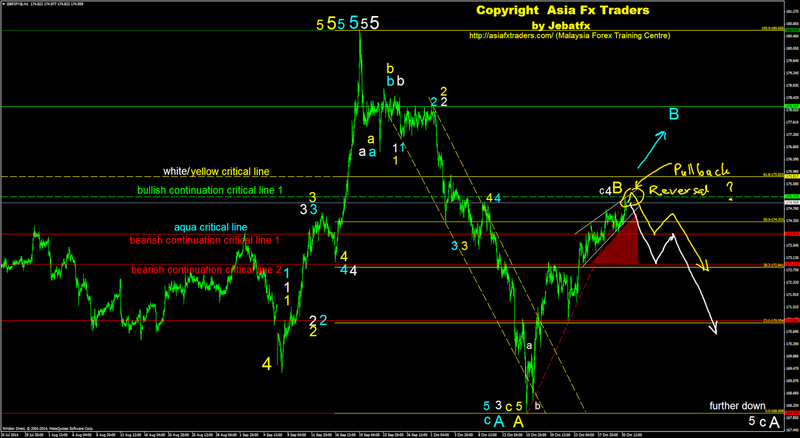 Otherwise, we may see another bearish rally to complete wave 5 in aqua. Good luck. At the moment, I am looking forward for a potential of another bullish contination trend scenario either in white or yellow before expecting market to falls back. 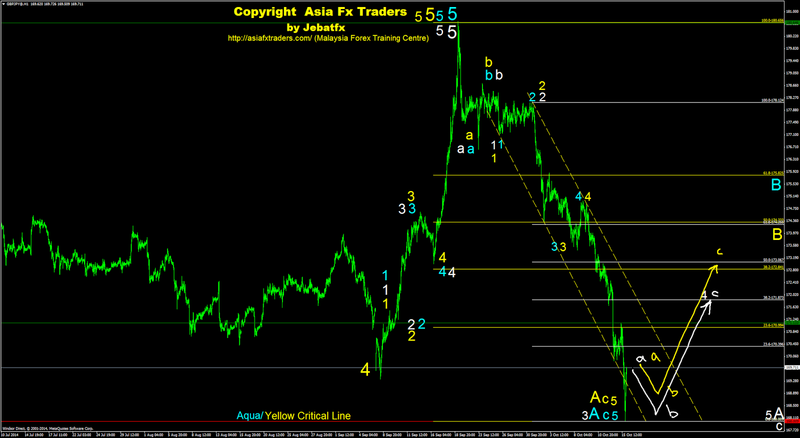 Otherwise, I believed we may see another bearish continuation trend scenario in aqua. Good luck. At the moment, I believed market in progress either to complete subwave 4 (aqua or white) or corrective wave B before expecting another bearish rally. Please be extra careful since market potentially may go up further to complete subwave 4 in white or corrective wave B in yellow. Happy Deepavali and good luck. 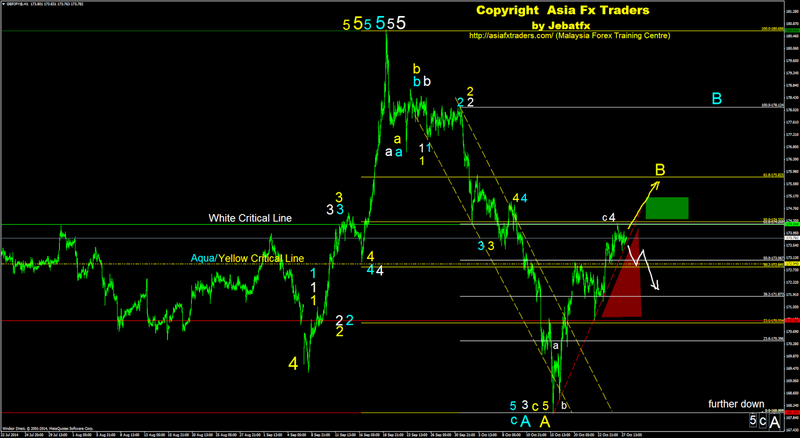 Favourably, I am looking forward for another bullish continuation trend scenario to complete either wave 4 in aqua or corrective wave B in yellow. 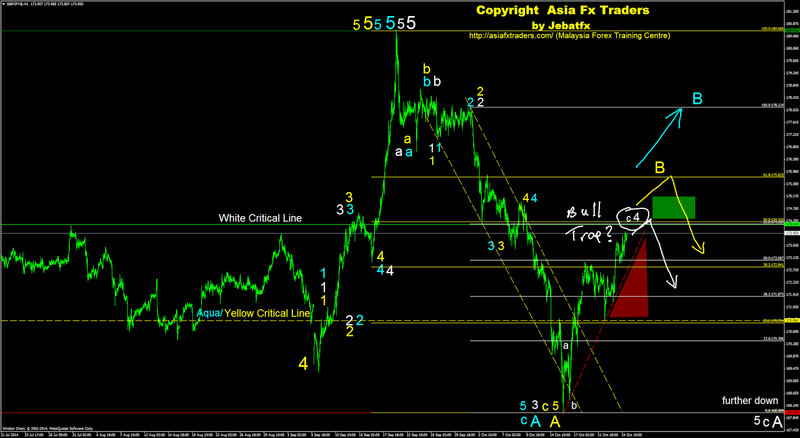 Otherwise, we may another bearish continuation trend scenario to perform wave 5 in white. Good luck. 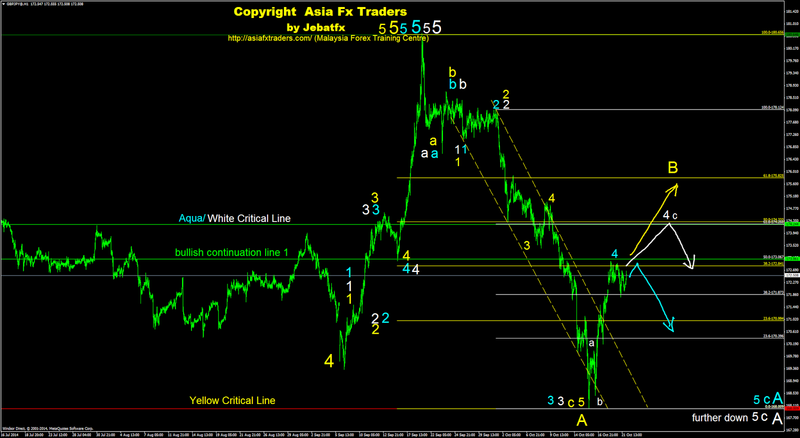 Preferably, I believed market in progress either to complete subcorrective wave 4 in white or corrective wave B in yellow before expecting toward another bearish continuation trend scenario. 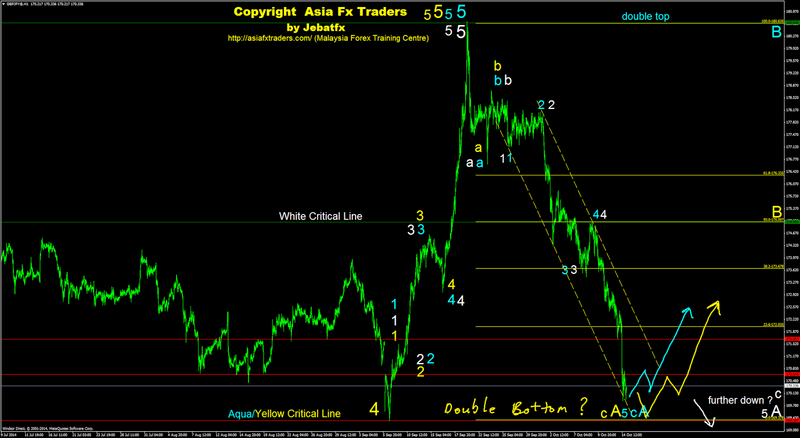 Otherwise, we may see another bullish rally to complete a double top of corrective wave B in aqua. Good luck. At the moment, I am expecting towards a bullish retracement trend scenario either to perform subwave 4 in white or correcrive wave B in yellow @ aqua. This scenario is valid as long the aqua/yellow critical line remain intact. Please be careful toward any potential of a bear trap. Good luck. Gbp vs Jpy (Daily) - At the moment, I believed market in progress to perform a reversal trend scenario to complete corrective wave a. 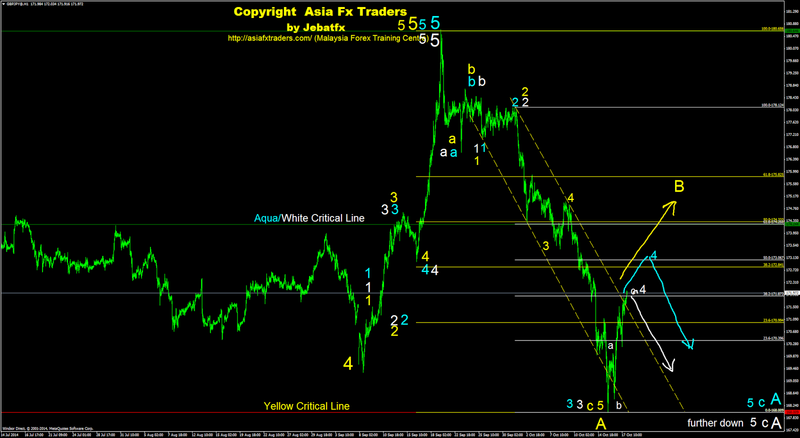 A strong bounce would indicate that market in progress to perform corrective wave b either in yellow or aqua. Otherwise, I believed we may see another strong bearish continuation trend scenario to complete corrective wave a in white. Gbp vs Jpy (1H) - Favourably, I am looking toward a potential of a "double bottom" scenario to bolster towards completion of corrective wave A in yellow. A "bear trap" or strong bounce would support this scenario. 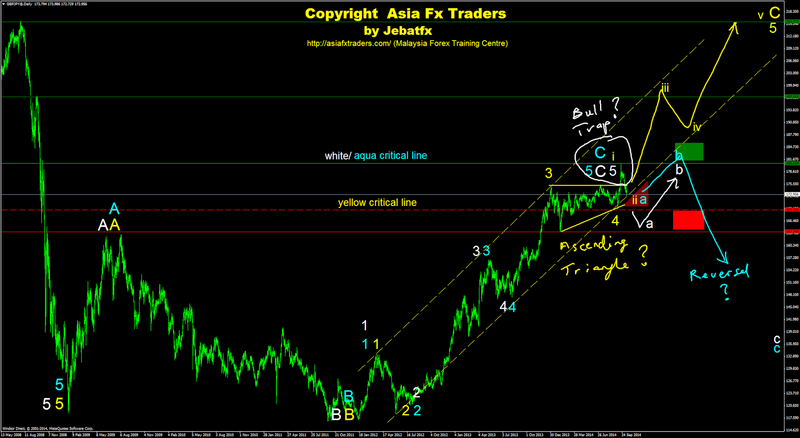 Otherwise, I believed we may see another bearish continuation trend scenario to complete corrective wave A in white. Good luck. At the moment, I am looking forward for a potential of market reversal refering to the alt count in aqua. Otherwise, I believed we may see another weakening bearish continuation trend scenario in white before expecting a reversal. Good luck. Gbp vs Jpy (Daily) - Favourably, a valid ascending triangle in yellow would bolster toward a bullish continuation trend scenario to perform another motive subwave iii, iv and v in yellow. Otheriwse, we may see a valid bull trap pattern to complete a reversal trend scenario to complete corrective a, b and c either refering to the alt count in white or aqua. Gbp vs Jpy (1H) - Preferably, I am looking toward a potential of bullish continuation trend scenario either to perform subwave iii in yellow or corrective wave b in aqua. 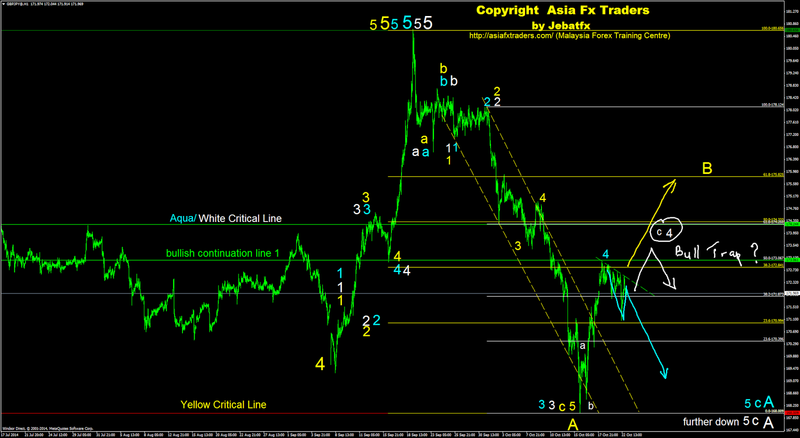 Otherwise, we may see another bearish continuation trend scenario to complete subwave 5 in white. At the moment, I am looking forward for another bullish continuation trend scenario refering to the alt count in yellow. A valid interted HnS pattern would bolster to this scenario. Otherwise, please be careful toward a potential of another strong bearish continuation trend scenario in white. Good luck. Pada masa ini, saya mengharapkan pasaran akan naik semula merujuk kepada kiraan kuning. Pengesahan struktur "Inverted HnS" akan menyokong fenomena ini. Sebaliknya sila hati hati akan sebarang keberangkalian pasaran membuat jatuhan kuat merujuk kepada kiraan wave putih. 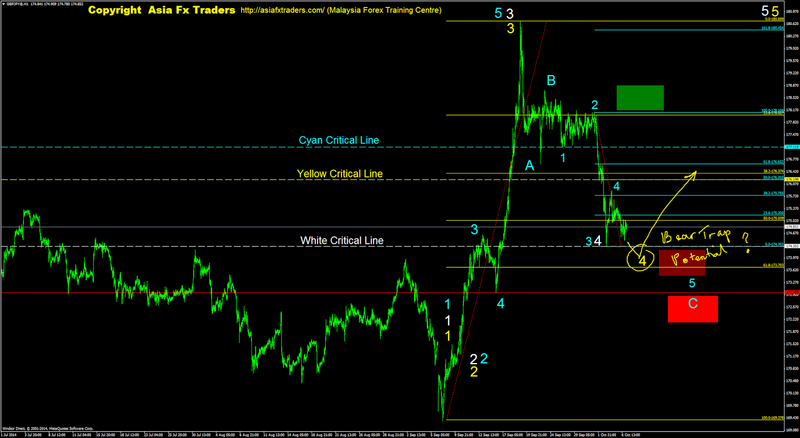 Hopefully, I am expecting market to go further up to complete wave 5 in yellow. 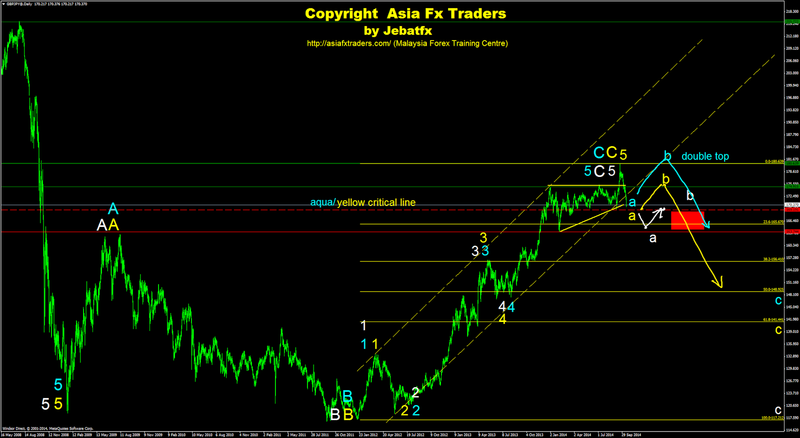 But this scenario will be invalid if market further go down and break the yellow critical line. 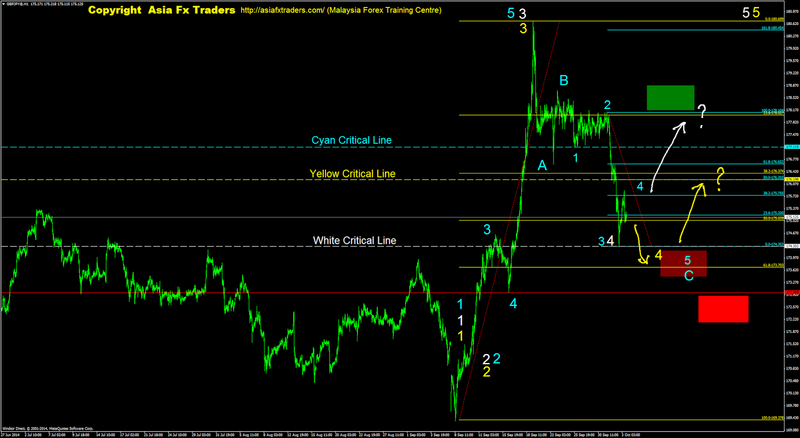 If this do happen, then I believe the market in progress to complete wave 5 either in cyan or white. Good luck. Saya mengharapkan market akan terus naik untuk melengkapkan wave 5 dalam kuning. Tetapi keadaan ini akan menjadi tidak valid sekiranya market terus jatuh memotong garisan kritikal kuning. Jika ini berlaku, maka saya berpendapat pasaran akan terus jatuh untuk samada melengkapkan wave 5 dalam cyan ataupun putih. Hati hati. Preferably, I am looking forward for a bullish continuation trend scenario refering to the alt counts either in yellow or cyan. A breakout to the upper yellow trendline would bolster to this scenario. 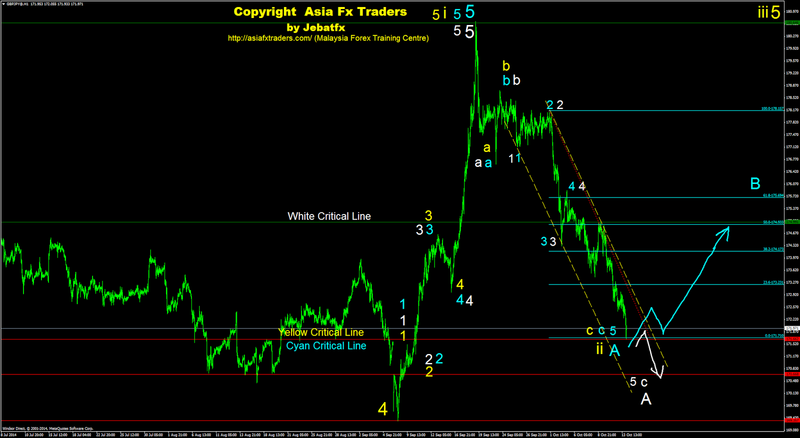 Otherwise, please be careful toward another bearish continuation trend scenario in white. Good luck. Saya meramalkan market akan naik semula samada merujuk kepada kiraan wave kuning ataupun cyan. Keadaan pasaran naik yang seterusnya memotong garisan trend atas yg berwarna kuning akan menyokong lagi ramalan ini. Sebaliknya pasaran boleh membuat jatuhan yang kuat merujuk kepada kiraan putih. Hati hati. 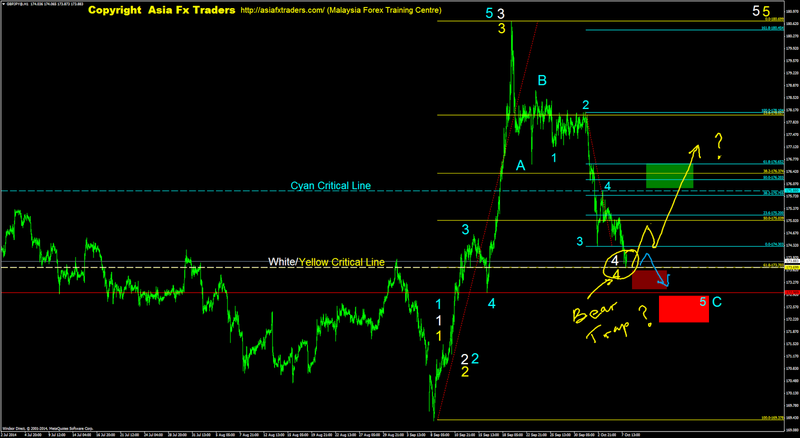 Favourably, I am looking forward market to going up to compete wave 5 in yellow. 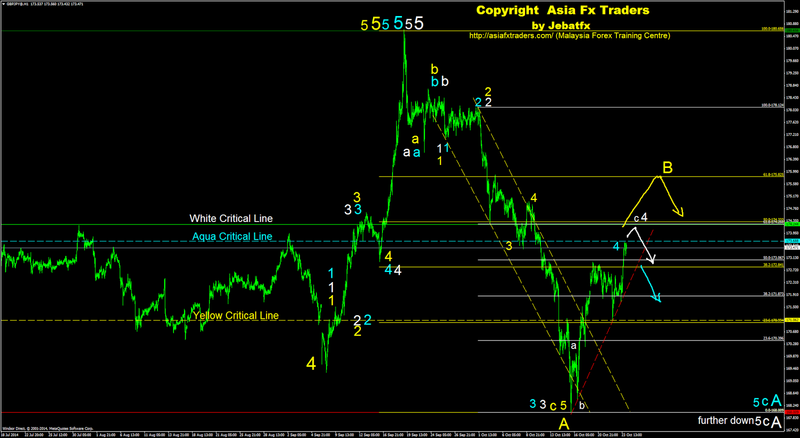 Otherwise, we may see another bearish continuation trend scenario to complete wave 5/C in cyan. Good luck. Saya mengharapkan pasaran akan naik semula untuk melengkapkan wave 5 kuning. Sebaliknya jika ini tidak berlaku, maka pasaran akan terus jatuh untuk melengkapkan wave 5/C dalam cyan. Hati hati. 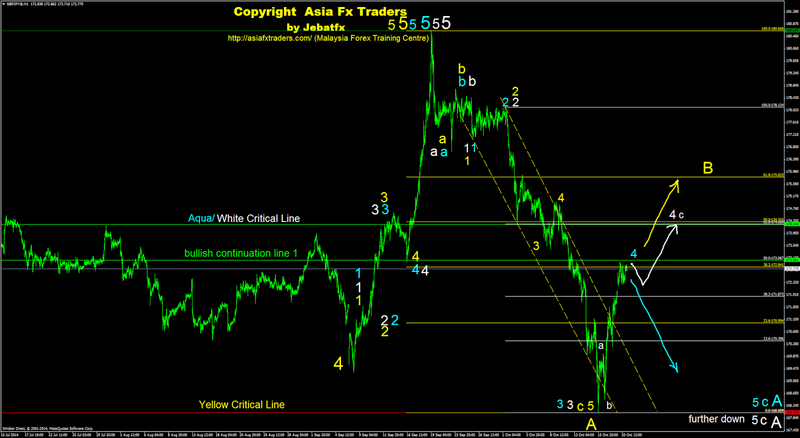 Preferably, I am expecting marklet to perform of a "bear trap" scenario before making another bullish continuation trend to complete wave 5 in yellow. 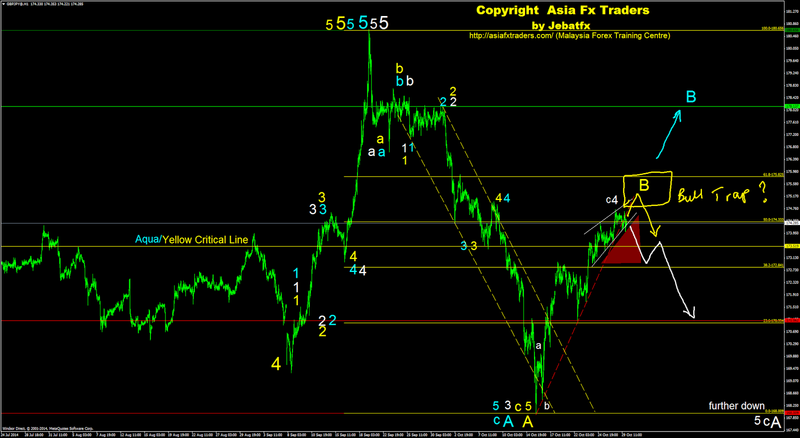 Otherwise, we may see another bearish continuation trend to complete wave 5 in cyan. Good luck. Saya menjangkan pasaran akan membuat sedikit jatuhan sebelum naik semula untuk membuat wave 5 dalam kuning. Sebaliknya, pasaran boleh terus jatuh untuk membuat wave 5 dalam cyan. Hati hati. 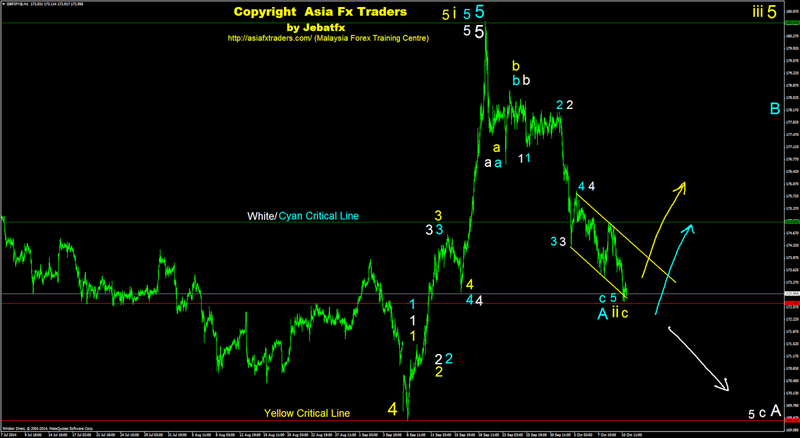 Looking forward for another bearish continuation trend scenario either to complete wave 4 in yellow or wave 5 in cyan. Good luck. Merasakan pasaran akan terus jatuh samada untuk lengkapkan wave 4 (kuning) ataupun wave 5 (cyan). Hati hati.